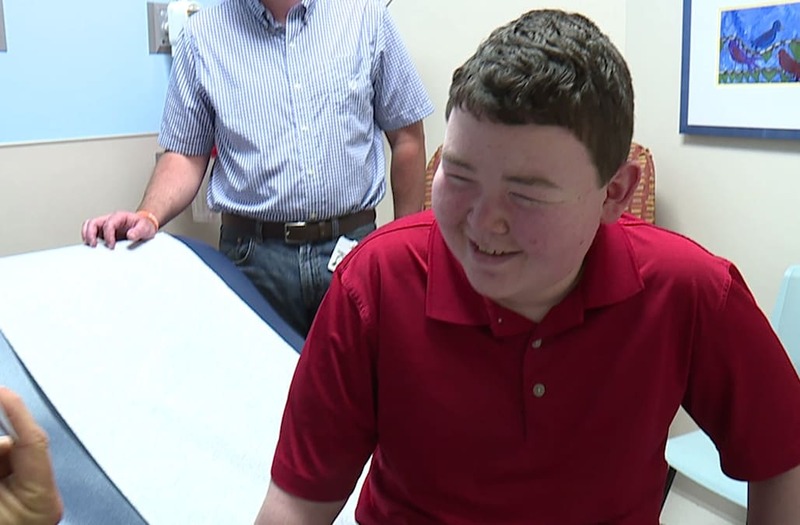 GRAND RAPIDS, Mich. (WXMI) — Tobin Crook, 14, walked out of the elevators with his parents, brother and sister for what he thought would be a routine visit at Helen DeVos Children's Hospital Wednesday. "As of today, all of your chemotherapy shall cease and desist," said Dr. Dickens. And then Crook looked back at his parents a bit confused. "You shall forfeit all of your chemotherapy, transfusions and any other emetogenic substances herein," Dr. Dickens continued. Until it all made sense, and Dr. Dickens handed Crook an extraordinary prescription. "On this prescription it says you must immediately leave our clinic and go head out, so you can start planning your Royal Caribbean Cruise, this Friday," said Dr. Dickens to a room of laughter. "You want it?" When Crook shook his head yes, Dr. Dickens said: "Good. That's yours. We're done. Congratulations Toby, you win." Going downstairs, wearing a sailor's hat from another hospital employee, Crook walked into surprise number two: the lobby full of Make-A-Wish Michigan and hospital employees, patients and some friends. "I was kind of just shocked for a moment, like wait I'm really going, I can go?" Crook said to FOX 17. Crook just finished the eighth grade and said two years ago he was diagnosed with Non-Hodgkin's Lymphoma. He underwent treatments including chemotherapy until now and is enjoying the start of his summer and living in remission. "I don't really know how to explain, it's just like, I just feel so happy that it's almost done," said Crook. And even during his moment, as he walked into his surprise party, Crook stopped to talk to a boy he overheard was about to start his first treatment and said to him: "It's a long road, but there is an end and you will finish it." Crook is Caribbean-bound with his parents, sister and brother on their way to Mexico, Jamaica and Haiti. "I think [his siblings] are looking forward to this trip as much as Tobin," said Todd Crook, Tobin's father. "It's going to be a break and some relaxing time for them too." Make-A-Wish Michigan is on track to grant about 450 wishes to children in Michigan this year.